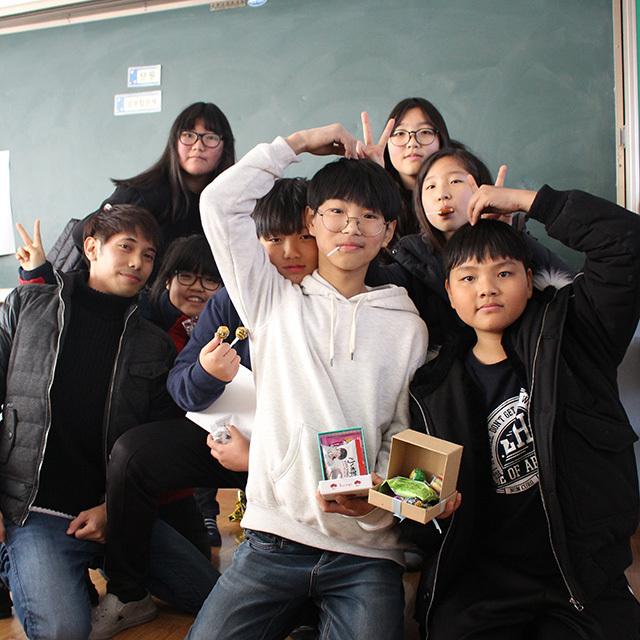 Andrew Toledo (far left) with his Advanced After-school English Club, in mid-Secret Santa gift-exchange. Andrew Toledo had always wanted to teach abroad, so after he graduated from San Diego State University with a degree in psychology, he did a Google search and found that his alma mater had the very thing he was looking for — a TESL/TEFL Certificate program, through the American Language Institute. Because he had a part-time job at the time, Toledo chose the 11-week nighttime program to complete the 130-hour certificate. (There’s also an accelerated daytime option of four weeks of intensive study.) Then he took advantage of the program’s free worldwide job placement assistance. “It was great,” said Toledo. “I was able to get a job in South Korea on my first try. This could also be due to my facilitating experience with the Intensive English Program at the ALI, boosting my résumé and chance of getting hired.” He answered a few questions about the program, and his experience teaching English abroad. Andrew Toledo’s 6th grade students in from of the Gyeongbokgung Royal Palace in Jongno-gu, near the Seoul main district. What made you choose South Korea? I chose it because I somewhat studied the language independently and have several South Korean-American friends. I felt pretty comfortable with the culture and already enjoyed the food, so it was an easy choice. At first I wanted to try Taiwan, but it was quite difficult for an Asian-American to find a job there. Why is it difficult for an Asian-American to find a job in Taiwan? Lots of private English schools in Taiwan are still a business, so they require that “White American” look in order to sell their services to parents. I would look great on paper, however due to many CVs and resumes requiring a photo of yourself in Asia, I was turned down quite a bit. I even used my connections in Taiwan where my friend’s mother was able to ALMOST get me a job. They were in the process of hiring me, but once they saw that I wasn’t White (not fitting the American stereotype), I was quickly ghosted. Where did you live in South Korea? I lived in Geoje-Do, the second largest island in South Korea, just south of Busan. The island isn’t necessarily isolated from the mainland and is connected by a large bridge named Goga Daegyo. It’s an industrial island famous for its shipyards. My village (Hacheong-Myeon) was small, consisting of elders and Daewoo ship workers. It’s an old traditional farming village reminiscent of Korea in the 1980s. 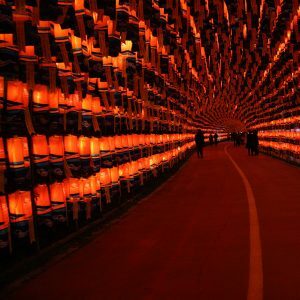 I invited some of my Korean friends from Seoul to my village, and they were amazed and said it looked like a movie set! Although it was quite rural, I enjoyed every single day and did not necessarily feel lonely at all. It was refreshing to see kids playing outside, elders taking walks, people using the bus system constantly, all while being surrounded by nature. It was a great mixture of nature and social life. Keep in mind it’s a village, so stores and restaurants don’t stay open very late. That being said, all I had to do was hop on a bus and head to the downtown area, which was only 15 minutes away, if I felt like having a nightlife. If I wanted to go to Busan (second largest city in Korea), I could just hop on a bus and be there in about 1 hour. By the way, buses are always on time. It’s great! I would wake up at 6:30 am to have breakfast in my apartment and walk a whopping 1/4 mile to work, which started at 8:30 am. I liked waking up early because I don’t like rushing to get myself ready. I worked at three schools in three different villages. Because I built such a strong relationship with my co-workers, I was offered rides to work and didn’t need to rely on the bus for my morning commutes. My students were all elementary students with very little English skills and pure hearts. I have heard great things about rural children compared to those who live in the city, and I believe it. Although students were a little hyper and rowdy, they were interested in learning, usually respectful, and enjoyed interacting with me (both in and out of the classroom). I still wonder about them today and hope they are getting a quality education. Were there TESL/TEFL instructors from other countries at your school? Nope, I was the only foreigner at my school. In fact, the whole village only had two foreigners in total! It was a challenge, but my Korean language skills definitely improved and I made several South Korean friends that I still keep in touch with today. 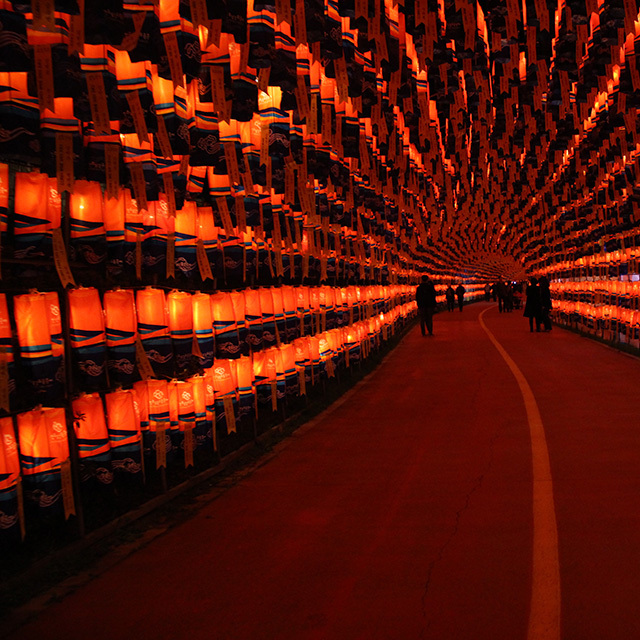 The annual Jinju Light Festival. Do you have anecdotes to share: small world occurrences, unexpected humor, places you explored? Two years in Korea, so I have sooooo many! I’ll only report about two briefly. 1) I was there for the impeachment of Park-Geun-Hye. [Editor’s note: The 11th president of South Korea, 2013–2017, and the first woman.] It was actually illegal for me to be near protests, but you can’t stop the protest from coming to you. I was on the bus heading to Seoul when some protesting farmers decided to walk their cows on the freeway as a form of demonstration. It was interesting and I couldn’t avoid it, but it did hold up traffic and I reeeally needed to use the bathroom. 2) My first instance of homesickness was somewhere in my first two months of South Korea. My co-workers wanted to play volleyball (we played every week), but I wasn’t emotionally willing on this particular day. I had feelings of loneliness, missing home, and culturally isolated. My co-workers went outside without me and I could hear them having fun, but I stayed in my office to work on lessons to keep my mind busy. All of a sudden, I heard my name being yelled from outside. My windows were closed, so the voices were faint. I opened the window and saw my school yelling for me to come out and play. It was heart-touching and I couldn’t say no after seeing that! So I ran out and joined them for volleyball. I ended up losing because I’m terrible at volleyball, but it was worth it! I love Korean food! I loved it here in San Diego, and I liked it even better in Korea! The meat was so fresh and had a distinct quality that only South Korea has. It is probably impossible to replicate here due to the way our food is processed in the U.S. My new favorite dish is a pork soup called Dwaeji-Gukbap. First-grade students in their music festival uniforms. Tell us about some of the friendships you made. So many! My co-workers, previous students I facilitated at the ALI, friends of friends, my boss from my part-time job in the U.S. and her friends, the random people I met in the cities and villages. I was quite social and enjoyed the amount of people I met. More importantly, I valued the few friends who I built strong relationships with. I still contact them to this day and we talk about visiting each other again almost every month. What do you think are the biggest strengths of the ALI’s TESL/TEFL Certificate program? The activities and how they support their graduates through facilitation opportunities. I have a notebook of all the different games and activities that I learned through the ALI. I’m pursuing my M.A. in International Education at SIT Graduate Institute in Vermont. I hope to work with International students coming into the U.S., preferably at the ISS (International Student Services) center at a university. I’m in my practicum phase at the moment and will be doing a 6–9 month internship at Colby-Sawyer College in New Hampshire. 1) Reverse culture-shock is real. One way I have been battling it is through food. I learned how to cook several South Korean dishes, so I like to bring those to parties and potlucks. It’s a great way for me to re-visit my experience and show others about my experiences without feeling pretentious. Let’s put it this way, I spent two years in Korea and when someone asks “What was it like?” they’re mostly saying “tell me in less than 5 minutes.” There is no way I can do that justice, and a majority of my story and experiences cannot be told without them losing interest. The only people who understand this feeling are those who have worked/studied abroad as well. Food is a great bridge to connect others to your experiences. 2) For anyone else thinking of working in South Korea, it’s not always easy. There are social norms you must respect, many South Koreans are quite shy, and socializing takes a bit of effort. Just remember, you are a guest in a new country, and sometimes guests are scary! There will be rocky times, and times where it is smooth sailing. With effort, a good heart, and a strong will to stand back up and try again, your journey will have more positive moments than negative ones.